There is another side to this, however, and it is one that can work in the favour of anyone seeking land for purposes other than building. Non constructible land in France can be far cheaper than that with planning or outline building consent, and ownership of such land can add hugely to the pleasure of your new life. In some cases, non constructible land can also be used to generate an income. Can land not suitable for building be redesignated? This is an oft asked question, and the short answer would be "Yes, it can". The small print, however, suggests that it is rarely worth gambling on this unless you have money to spare and are happy to take a risk. There are cases where land deemed non constructible can be later redesignated to allow building consent, but even if you pay over the normal price for agricultural land on the basis that it may be redesignated in the future, there are no guarantees. Sometimes false hope that the land may be given building consent is raised by the seller claiming that it is only non constructible as there are no services such as water or mains drainage, leading prospective purchasers to assume that if they use a well, fit septic tanks and install links to services (Connecting utilities (water, gas, electricity, telephone and sewage) in France) they will obtain building consent, but once again, this is a gamble I would not advise taking. The safe route is to accept that if a parcel of land for sale states it is non constructible, it is exactly that. The purchase of land in France is subject to similar fuss and checks as any other property purchase (Property sales in France). The government agricultural agency, SAFER, has to be notified and will have first rights to buy the land should they wish. You will also need to pay a notaire to draw up the paperwork and to act for both you and the seller. You will have to pay taxes and also any fees due on a mortgage or loan should there be one (Buying a French Property - The Fees). The actual price per hectare (10,000 square metres or approximately 2.5 acres) of agricultural, leisure or non constructible land varies from department to department and according to its quality, location, access and potential. SAFER are the best people to contact, although again, the local mairie may be able to give you a guide price and contacts for more advice. Non constructible land can, of course, be used for many different purposes. Good pastureland rarely comes for sale, but if it does it can be ideal for anyone wanting to keep horses (Horses in France), run a livestock related business such as keeping goats and/or chickens, or to run a smallholding. Sometimes permission to use the land for camping may be granted, although this is subject to strict controls and must be carefully looked into before purchase. 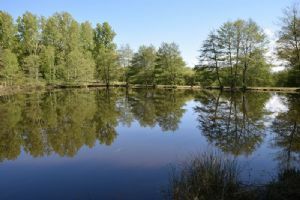 Non constructible land may also be offered for sale with a lake, and if you obtain consent for fishing (Fishing in France) and a fishing business you may have a good way of obtaining an income. 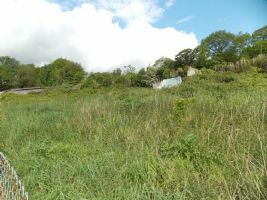 Land not suitable for building is sometimes also classified as leisure land, meaning it can be used for a variety of activities such as horse-riding or dog training, and in some cases it can be possible to site a caravan or tent. Permission for a caravan should be sought from the mairie. 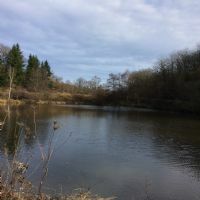 An opportunity to buy a fishing lake in the Mayenne of around 2 500 m² on a plot of just under 1.5 hectares partially wooded. 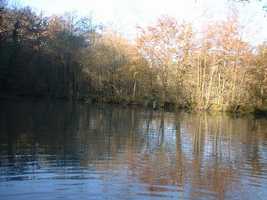 The lake is fed by streams but also by a spring which means that there is never a risk of it drying out. 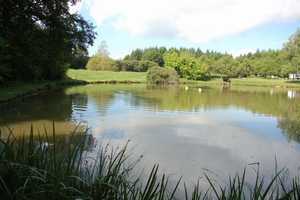 A beautiful 1.5 acre (approx 6000m2) lake set in 7.5 acres of woodland and pastureland. Located just 10 minutes from Limoges airport. There is a small cabin on the land which is in need of repair, or can be replaced with something of a similar size. There is no building permission with this land and the lake has never been used commercially. 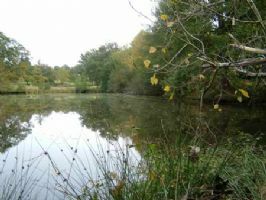 Tranquil lake of 5000m², on a plot of land (not constructable) of 5ha in total. The purposely planted poplar trees and 3000 Douglas fir trees make it quite special. There is a small cabin of 10m² for storage on the plot. The lake is easy accessable. You are not allowed to build a log cabin, or house on the land. The little shed can not be extended or build up. 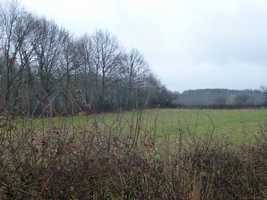 Flat leisure land of 20.135 m² located 500 m of a village with all amenities (Autignac). Flat leisure land of 20.135 m² located 500 m of a village with alla amenities. No water or connexion to electricity. Ideal for gardening or leisure for the WE. Land with an L shape along a country road with an easy access. Lovely views. 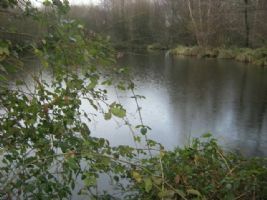 Lovely 10 acre property with two lakes. 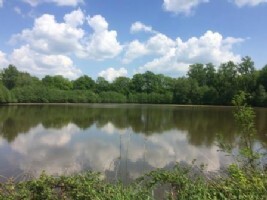 2 fully compliant fishing lakes each 7 000m2 (1.7acres) set in a 4.4 hectare (10.8 acre) site suitable for tourist, cultural, sporting and leisure activities. A piece of land is never just a piece of land, and the same rules/prices cannot be assumed to apply to land in different areas, different types of terrain and any other variable. You may be allowed to put up a log cabin holiday home or site a mobile home making it a perfect holiday solution, but equally, this permission may be denied. You may or may not be able to turn your non constructible land into a business venture. If in doubt, check it out. That said, land is always a valuable asset, for as the old story goes, they just aren't making it anymore. Can you erect a shed 20 sq mtrs not in a building zone area? Many thanks. Thanks for contacting us, though I would suggest you contact the Mairie to get advice about this, as rules may vary between departments.